7. Reach out to a colleague. 1. Ask a colleague for help. ​The ever wise, David Rogers (@davidErogers) once reminded me that “Sometimes we scan the galaxy for good practice when it's in the classroom next door.” No one can deny the power of social media to forge connections however, as the ORRsome Rachel Orr reminds us, there are other ways that teachers can reach out and connect without the aid of shiny tech! ​​Good teaching thrives when teachers work together, one of the simplest ways to connect with other teachers in your school is to ask for help! Whether it’s help on classroom management, assistance with some classroom tech or support with a troublesome pupil, asking for help can provide that simple olive branch that helps you start building connections with your colleagues. But remember, the door swings both ways! Being available when others need help is another way to build positive relationships with your colleagues. Many schools have an ‘Open door’ policy where staff are free to wander in and out of each other’s classrooms. An open door policy is great for fostering a ‘We’re not alone’ and ‘We’re all in it together’ ethos but it’s also great for creating an ‘Aladdin’s cave’ of free ideas and resources! In-fact, one of my favourite strategies ‘C3B4ME’, was discovered during an impromptu visit to a colleague’s classroom, thanks to a lovely poster on the wall! So, even if your school doesn’t have an open door policy, leave your door open because, you never know, it may just encourage others to pop in for a chat! And, if it’s not help you’re looking for, why not ask for some feedback instead! Feedback doesn’t have to be judgemental, nor does it have to be graded, in fact, some of the best feedback I’ve had didn’t come from observations from school leaders but instead from informal conversations with friends and colleagues. 2. ​Share something that works with a colleague. ​We all have particular strengths when it comes to teaching, for some of us it’s classroom management, for others it’s assessment. 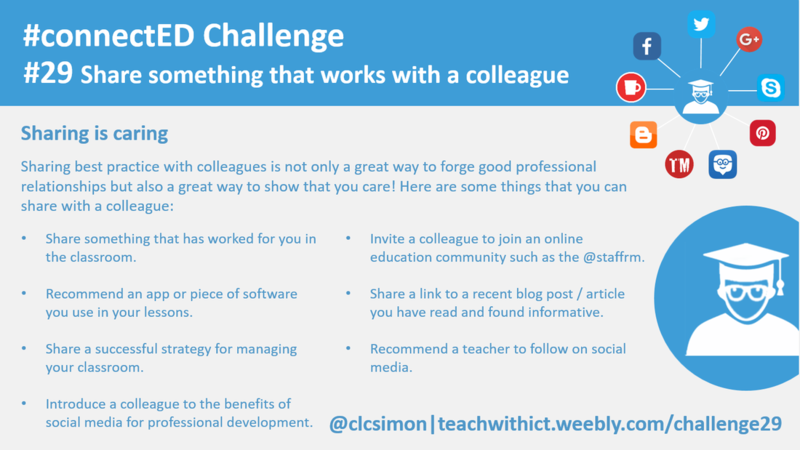 Why not share something that works in your classroom with a colleague? Sharing best practice with colleagues is a great way to forge good professional relationships and also a great way to show that you care! 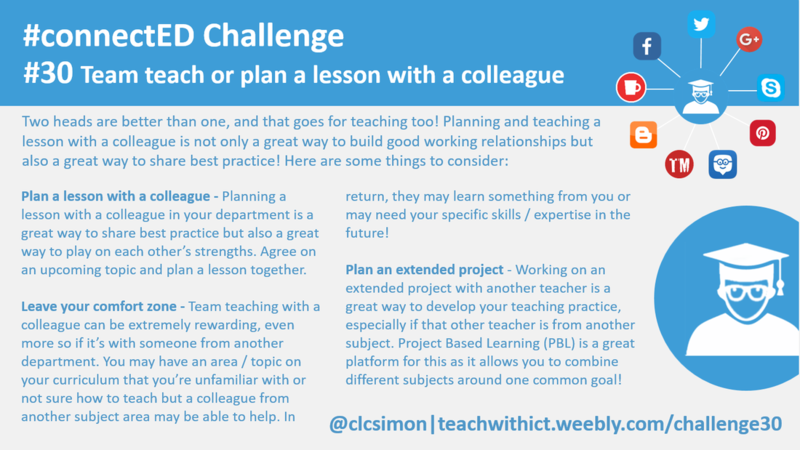 Share a strategy that works for you in the classroom, share a great resource that you found online or, if you’re technically minded, show a colleague the benefits of Twitter or Pinterest or even help them to set up an account. They say that two heads are better than one, and that goes for teaching too! Planning a lesson with a colleague is not only a great way to build good working relationships but also a great way to share best practice! Agree on an up-coming topic or unit with a colleague and plan a lesson together. Planning and teaching with a colleague can also be extremely rewarding, even more so if it’s with someone from another department. You may have an area / topic on your curriculum that you’re unfamiliar with or not sure how to teach but a colleague from another subject area may be able to help. In return, they may learn something from you or may need your specific skills / expertise in the future!